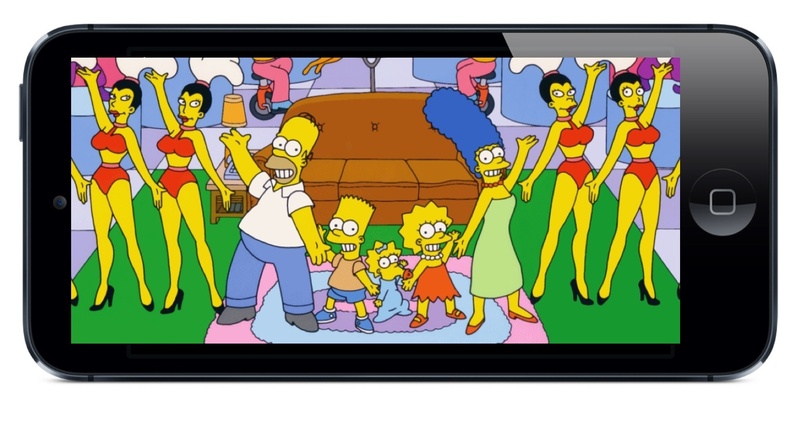 Stream The Simpsons on your mobile device this Summer — woo hoo! On Android? No love just yet for Android users and, although the iOS app is arriving first, watching The Simpsons will require a cable TV subscription. Enough caveats for you? Fox being Fox, there are quid pro quos because that’s how they roll. All 24 seasons of The Simpsons, encompassing 530 and counting episodes, will be available for streaming via FXNOW, the recently launched video-on-demand service that brings together the FX, FXM and FFX broadcast and cable networks. Pretty cool, eh? However, you’re gonna wanna hold off on cracking open a celebratory ice-cold Duffs. Why? Because to stream The Simpsons, Fox has conditions. First of all, the FXNOW Simpsons app for iOS won’t arrive until at least August of this year. Further, as of this writing, there is no Android app and no hint as to when it will arrive. Next, streaming The Simpsons on an iPhone or iPad will require a cable TV subscription. Given that Fox has only inked streaming deals with about half of the US cable companies, overpaying for TV isn’t enough — you’ve got to be overpaying the right cable operator. Those quid pro quos seriously limit who will be able to stream The Simpsons come August. Of course, a lot could change, for better and worse, between now and then. However, Landgraf predicts that someday most if not all of Fox’s advertising revenue will come from mobile and online, meaning the cable tie in could eventually go away. “But it’s going to be a very long, bumpy road over the next 10 years to get from here to there,” he added.